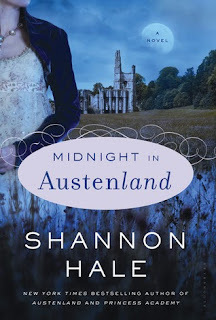 If you liked Austenland, then I think you will like MIDNIGHT IN AUSTENLAND. I was thinking this was going to be an Austenland romance for a new character, but essentially the same story. Yes, this has a woman going to Austenland for a vacation, and yes, she is looking for romance, but this book was much different than Austenland. This book is a mystery! I had no idea when I started it that it was going to have a mystery involved with the romance. It was a nice little twist. One of the things I liked about the book was the main character Charlotte. I identified with her insecurities. I may not have the same situation as her, but her "inner thoughts" were thoughts I would have as well. There were a couple of points in the book where I thought, "this could end now, why isn't it ending?" I have come across many books that end when the gentleman declares himself to the lady. This book continued to work on tie ups with the mystery and other characters in the book. And, I liked that it gave a bit of closure. Part of me wished it would even go on further to tell us how everything worked out, maybe a year later, but alas, I'll have to dream that part up for myself. I love Shannon Hale's writing. She is so witty. I found myself laughing out loud and then turning a page with heart pounding suspense. And of course there is romance. I love the way Shannon Hale describes the feelings within Charlotte, her confusion, excitement, and just letting go.